If students are to become good writers, we need to help them become strategic, knowledgeable, and motivated writers who are not hampered by inefficient or faulty transcription and sentence construction skills. When students let the reader know to pause or stop at punctuation, it’s a head nod. When they use accurate spelling, it’s a big smile. A capital letter used correctly is the equivalent of direct eye contact that urges the reader to keep going. When conventions are used incorrectly, or not at all, it baffles the reader. Children use writing to share information with others. By watching an adult write, they are introduced to the conventions of writing. Read more about writing conventions! Writing conventions are the mechanics of writing, like capitals, punctuation, and handwriting. When students can apply these mechanics without effort, they are able to give their attention to the higher order aspects of writing like idea generation and word choice. 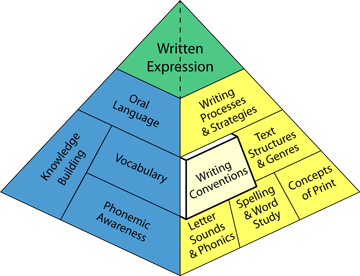 For students to communicate their ideas effectively in writing, they need to be taught how to use writing conventions effectively. One of the best ways to assess students' knowledge of writing conventions is to look at their writing. By doing so, teachers can observe students' use of punctuation and capitals, and the size, spacing, and legibility of their printing. It is also helpful to watch students write during small group instruction. Observe the way students form letters, since letter formation is as important as neatness, and monitor student progress throughout the school year.